April | 2014 | Not Your Average Hockey Blog. As the playoffs begin there is really only one thing that is certain. It’s going to be one great run and the victor will have truly earned it. The playoffs are going to be exciting and filled with many hard-fought battles. Let’s take a look at some of the first round match ups and other headlines going in. I only did the Eastern conference because I have a lack of knowledge of the West and I don’t think I deserve to give my opinion. Maybe next year but definitely not this years playoffs. But let’s take a look at the first round of the Eastern Conference. This is a battle of two team that have very different stories heading into the playoffs. Bruins cruised to the President’s Trophy while the Red Wings had to claw their way past injuries and find ways to win without key players. I know that this series will be a close and competitive series for the most part. You have two amazing and very experienced behind the benches that are well proven. You have two team that are willing to compete and are hungry. I think that this is going to be one of the closest matches in the first round and it’s hard to pick a winner. But I give the edge to Detroit. They have been battling all season long and are not going to give up now. Most people will disagree with me but I’m not saying that the Bruins are a bad choice. I think that this series is going to go right down to the wire but I think Detroit will go the extra mile and find a way to beat the big bad Bruins. Now let me say first is that I’m a huge Habs fan and I really hope that they win. This year has been a great one for the Canadiens and for the first time in a while they have gotten great performances from though out the lineup (even from their backup goalie!) I also believe that the Bolts have a great lineup and they have been absolutely stunning. I honestly thought that the Callahan trade would hurt them but it seems that they went unsaved for the most part! In fact I’m terrified to have them as an opponent but there is one X-factor to take in. Tampa Bay’s star player (in my opinion) who has carried his team on his back is injured. As of when I’m writing this article (April 15th 2014) Ben Bishop will not start game one of the series. In all honesty the performance of the Bolts goal tending will be the deciding factor. Whether it’s Lindback or if Bishop comes in half way through their goal tending will be what decides this series. Both team are dead even in all other areas and almost identical to each other. I give Montreal the win just of the fact that Bishop is out. If he were to be healthy I would give Tampa the series win. But who knows, maybe Lindback will stand on his head. All I know is that this is going to be one amazing series and I cannot wait to see the result! This will be an interesting match for sure. Pittsburgh has been a hockey super power for a long time now. But as of late they’ve looked great on paper but have failed to show it on the ice, especially come playoff time. Then Pens had a scare last season against the Islanders and I believe that the Jackets can do the exact same this year. If Columbus comes out and plays a physical and high intensity game like the Flyers play then they can get a great jump on the Penguins. For the Penguins, they have to stick to their style of play and don’t let their emotions get the better of you. The Flyers were able to push the Pens around and get them angry and off their games. If the Blue Jackets can make their style of play a bit like that but keeping their amazing scoring intact then they have the advantage over the Pens. I see a constant fore-check as a key for both teams to gain leverage. But I give the series to the Penguins just because of the amount of skill that they have and the way Fleury has been playing (make sure he doesn’t choke like he has in the past few years) then they should be good to go. This is a series that I am excited for. Two great physical and defensively sound teams that are also rivals! I’ve always liked a good rivalry but I’ve seen so little of it lately. I really hope that this playoff series will help rekindle that fire. I hope to see a lot of grit, a lot of shoving, and a lot of players hacking each other. You also have incredible scorers such as Rick Nash and Claude Giroux in this match up. Both players had a slow start to the season but picked up their play as the season progressed. There is also the sleeping giant Martin St. Louis! All I know is that this is going to be an exciting series! I give the Flyers the edge because they have been fighting all season and have been able to perform in pressure situations. The NHL playoffs are upon us. 2014 is the first year of the new playoff format that was introduced along with the realignment of divisions. Teams will not be reseeded after each round and instead there is a bracket that will give divisional rounds, the conference finals, and the Stanley Cup Final. The first round of the playoffs is one of my favourite parts of the season, and this year’s first round is poised to be great! The Red Wings have the potential to upset the heavily seeded Bruins the way the early 2000’s-era Montreal Canadiens did. The main reason that won’t happen is the Finnish Wall the Bruins set up in front of their net before the start of each hockey game that goes by the name of Tuukka Rask. Aside from starring for the bronze medal-winning Finnish team earlier this year in Sochi, he is the Vezina Trophy front runner and a safety net should the Bruins have trouble getting the puck past Jimmy Howard. This Bruins team is simply too deep to lose four games to a Detroit team that is not what it used to be. Steven Stamkos scored at a 55 goal pace when he wasn’t sidelined due to wrapping his leg around a goal post in November. If he can continue that pace he will take some pressure off of Ben Bishop, a major Vezina contender, to match the play of the unflappable Carey Price. Montreal has an interesting mix of players and Tomas Vanek, while in no way Stamkos’s equal in the goal scoring department, is the true game-breaker that the Canadiens have lacked in recent years. The Habs have are never an easy draw, and Vanek and Price will outduel Stamkos and Bishop. The Columbus Blue Jackets are in the playoffs again for the first time since the 2008-09 season, the only other year they have qualified for the playoffs. They will be aiming for their first playoff win in franchise history on the strength of Ryan Johansen’s 33 goal, breakout season. While Sergei Bobrovsky likely won’t take home the Vezina trophy for a second straight year, he has shown that last year’s Vezina win was no fluke, and he has the ability to outduel Marc-Andre Fleury. While the Penguins are obviously an offensive powerhouse they lack depth, and Sidney Crosby, Evgeni Malkin, and James Neal are amongst the least robust players in the game. It’s not the first round of the NHL playoffs without a major upset; Columbus takes this series in seven for the surprise of the playoffs. Prediction: Blue Jackets in seven. This is as exciting a first round matchup as one can hope for, but maybe that’s just because I never know what to expect from the Philadelphia Flyers. Claude Giroux made up for his slow start to finish third in league scoring, and Wayne Simmonds and Jakub Voracek are rugged players that can score. The Martin St. Louis era in New York has gone puzzlingly poorly so far, and even though Henrik Lundqvist is one of the league’s best goalies, the Flyers will do whatever they can to get him off his game. The Flyers are a team built for the playoffs and love to drive other teams crazy. They’ll take it in six. The Colorado Avalanche were the surprise team of the year in Patrick Roy’s first season behind an NHL bench. Semyon Varlamov led the league with 41 wins, and the Avalanche boast an impressive top six forwards led by hard-nosed Gabriel Landeskog. Expect Landeskog to have an impressive playoffs. While a move to Minnesota has worked out well thus far for Ilya Bryzgalov, he’s not exactly the model of consistency. It will be easy for the Avalanche to get to Bryzgalov and take this series. The Blues have been decimated by injuries recently with leaders David Backes, T.J. Oshie, and Alex Pietrangelo out with various ailments. Backes and Oshie should be available for the first round matchup, but they might not be 100%. Despite their depth, the Blues won’t be able to replace players of this caliber to match the Blackhawks, who will have Patrick Kane and Jonathan Toews back from their own injuries just in time for the playoffs. This will be a long series and the winner likely won’t make it past the second round. Assuming their stars can dress I think the Blues will be able to take it, but regardless of who wins, I’ll be surprised if this series takes less than seven games to decide a winner. The Dallas Stars had the least amount of points of any playoff team, and while they had big years offensively from Tyler Seguin and Jamie Benn, those players will draw the Ducks best shutdown line every time they’re on the ice. It won’t be a fun first round for Seguin and Benn, but at least it will be short. Ryan Getzlaf and Corey Perry put up excellent years offensively and Teemu Selanne will be looking to go out on a high note. The Sharks are going to be in tough to shake their reputation as perennial playoff underachievers when they take on the Kings, the stingiest team in the regular season. But the Kings have appeared in the last two Western Conference finals, and they sent a bevy of stars to Sochi, most of whom played major roles for their respective countries – fatigue has to be setting in for this team. The Sharks’ desire to lose the playoff failure tag will ultimately make them too strong for a tired Kings team that will be worn down quickly. Yes, we’re really late to the party once again, but better late than ever! So here is our first NHL Mock Draft! These are my predictions based on my conversations with scouts, hockey players, what I’ve seen myself, and obviously a bit of gut feeling. The order is based on the NHL standings and not anything else because I am not smart enough to figure out who would get what pick. So without further to do, here is our NHL Mock Draft V1.0. Everyone can use a big centre right? He’s a great guy to push the rebuild forward. I feel that if the Oilers cannot get Aaron Ekblad, they will try to trade the pick for some defensive help. They have all the talent they want up front, but not much in the back end. Has great speed and upside. Just a little far fetched thinking, but the line of Klimchuk, Monahan, and Dal Colle will be something to consider for the future. Everyone wants a big centre and the Islanders are no different. Has had some comparisons to Jaromir Jagr. Averaging more two points a game in Prince Albert. Higher than most people expected, but the Canucks need some good young defenders now. The top five picks are pretty much consensus, but after that it’s a free for all. I have Ritchie up rather high not due to his skill, but team need. The RW shelves are pretty bare for the Hurricanes. The Leafs need help down the middle and Virtanen could provide good depth and power down there. It’s a shame eh? Ottawa could have used a guy like Tuch. Big 2-way center. Needs to make sure he continues to play defensively. They have all the talent in the world upfront with Nyqvist, Jurco, and Mantha. Could use a bit more help defensively in the future. He would make an interesting defensive pair with DeKeyser. I have a gut feeling that the Rangers may trade the pick and get a defenseman instead, but it’s impossible to assess the likelihood of trades. So I’m going with Dylan Larkin here. The best LW the Rangers have in the system is currently Pavel Buchnevic who isn’t expected to ever join North America. Quick feet, has a scoring touch. I wonder what he’d be like playing with Logan Couture? Yes, he’s the son of HOF’er Al MacInnis. Good centre, will need time to develop. Could use another defenseman in the system. Will take a bit longer to develop, but will be a serviceable defenseman in the future. Final thoughts: This draft is not as deep as last year’s draft, but there are still many good players available. Many of them will need time to develop, but many of them will be serviceable defenseman. 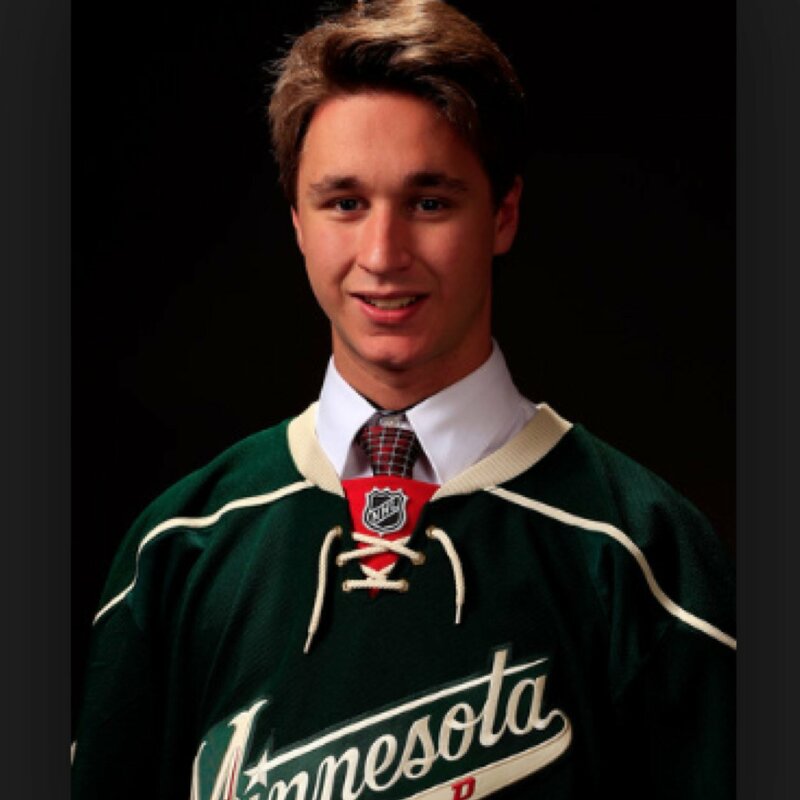 We recently caught up with Alexandre Belanger of the Rouyn-Noranda Huskies of the QMJHL and Minnesota Wild. He was drafted in the 2013 NHL Draft in the 7th Round 200th Overall. Unlike most players who get drafted at 18, Alexandre was drafted at 17! He is a great follow on Twitter so make sure to follow him on Twitter: @30_Belly. Make sure to follow me on Twitter as well: @hkyblogger. Without further ado, here is our interview with Alexandre Belanger! How do you spend your off days? I don’t do much during the season, since there isn’t much time for rest so normally I try to relax and play video games with some friends, watch movies or TV shows, or just chill out with my teammates. Do you have any pre-game rituals you like to follow? Not really. I like to switch things up. For example, if one game the things I’ve done worked then maybe the next game it won’t because it worked the game before. So yes of course I have a little routine but no rituals. What type of goalie do you consider yourself? I consider myself has a calm goalie with good positioning and a sharp gloves. I also have good technique and athleticism. What goalie do you think you play most similar to? A lot of people compare myself to Carey Price! Both of us are calm, have a good glove and play with good technique. Have you played any other position? When I started to play hockey I was a forward. I liked to score goals and had a very good shot but my skating ability was terrible haha ! After playing forward for 3 or 4 years,I loved goalies and wanted to try this position and I felt in love with it. So I started to be a goalie at the age of 8 years old! You were drafted 200th Overall. Were you scared of not getting drafted? I had no expectations when I went to the draft because I knew it was very hard to get drafted as a 17 year goalie. But still in the back of my mind I really wanted to get pick by a team because it was my dream since I was a little kid. So yes I was getting scared a bit at the end. Have you ever been challenged to a fight before? No I’ve never been challenged to a fight before! Who has the best shot in the QMJHL? Last year I would say that Martin Frk from Halifax had one of the best shot in the league! This year it’s hard to say! Maybe Francis Beauvillier on my team. I hate it when he shoots against me in practice haha. I have a few highlights in my career so far! The Canada Games in Halifax was awesome! I was on Team Quebec U-16 and I won a silver medal. The QMJHL draft where I was drafted in the 1st Round, 18th Overall, the World Under 17 championship in Windsor, Ontario, the NHL draft where I was drafted in the 7th Round, 200th Overall, and the Minnesota Wild pro camp. I don’t really have lowlights. Of course I had some trouble here and there but not much. What’s it like to take a puck off the mask? It’s never fun, but in my opinion it doesn’t hurt most of the time the puck usually deflects in the corner. The worst is to get the puck in the cage. Sometimes it breaks your cage and it hurts because the puck doesn’t deflect and your head gets all the power of the shot. Hard to say… I love to sing! I sing songs everywhere; in the shower, in the car, in my head. But the thing is, I’m not a very good singer! I just love music. There are players out there in the same position as you were last year in the chance that they wouldn’t be drafted. If you could give them some advice, what would it be? Just believe in yourself even if you don’t get drafted. If you work hard, good things will happen.